For those days when you want a quiet, relaxing moment to enjoy your pool, an inflatable float provides the perfect escape. There are many styles to choose from - stay high and dry with a thick pool air mattress or sit low and cool with a mesh bottom. How can one have a pool without a pool lounge float? They just go together like peanut butter and jelly. When we have friends over, that's the first thing they go for - there is always someone who is floating and relaxing in the all time favorite lounge float. So often I am entertaining grandchildren, neighbors and friends, that when I am alone I love to enjoy the peace and quiet of our backyard relaxing with a good book, a cold drink and floating peacefully in the pool. 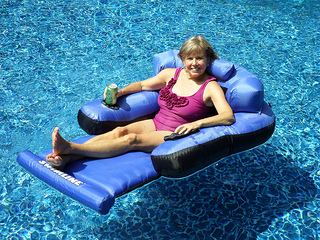 Swimming pool lounge floats can come with cup holders, adjustable headrests and or are made big enough for two people. They range in price from $10 to over $100. These floats come in different gauges of vinyl. The higher the number the thicker the vinyl. If the water is too cold or you'd like to read a book and not get wet this lounge float by Intex will keep you high and dry. It sits up high out of the water, so one can get in and out of it - very carefully :) - without getting wet. It's a great float for reading books and magazines thanks to the two armrests and a backrest. With a beverage holder included what could be better? The thick heavy duty vinyl makes it a sturdy and durable float that will last for several seasons rather than just one summer. For those who like to cool off with some water, this pool lounge float sits lower in the water with a mesh bottom to keep you cool on a hot summer day. With a backrest/headrest and a place to keep your legs up, this is truly a relaxing lounge float. Easy to fold up it doesn't take much storage space - as in our case since we need two of them. This is more like a recliner lounge chair - sitting up rather than lying flat. If you like sitting up and out of the water when the water temp is still too cool or you want to enjoy a book without getting wet, this is a great float. 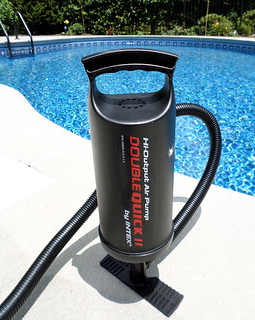 Just bring it to the shallow end of your pool by your steps and you can hop on and stay dry. Two large arm rests provide not only a comfortable place to rest your arms but stability as well so that this float is not easily tipped. Of course it includes two beverage holders so you don't need to get out of the pool to get a refill. Two strong handles on the sides make it easy to pull it out of the water. Be sure the plug is really secure so you don't start leaking any air. This is a sturdy and large float that can accommodate all sizes. Just like with any vinyl float, splash a little water on the dry vinyl so it's not so sticky when you get on it. 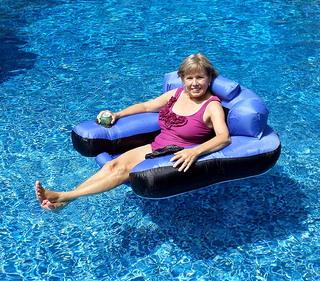 Once you try a fabric pool chaise lounge you may never go back to a hot, sticky plastic one. This float is made out of a comfortable study nylon. 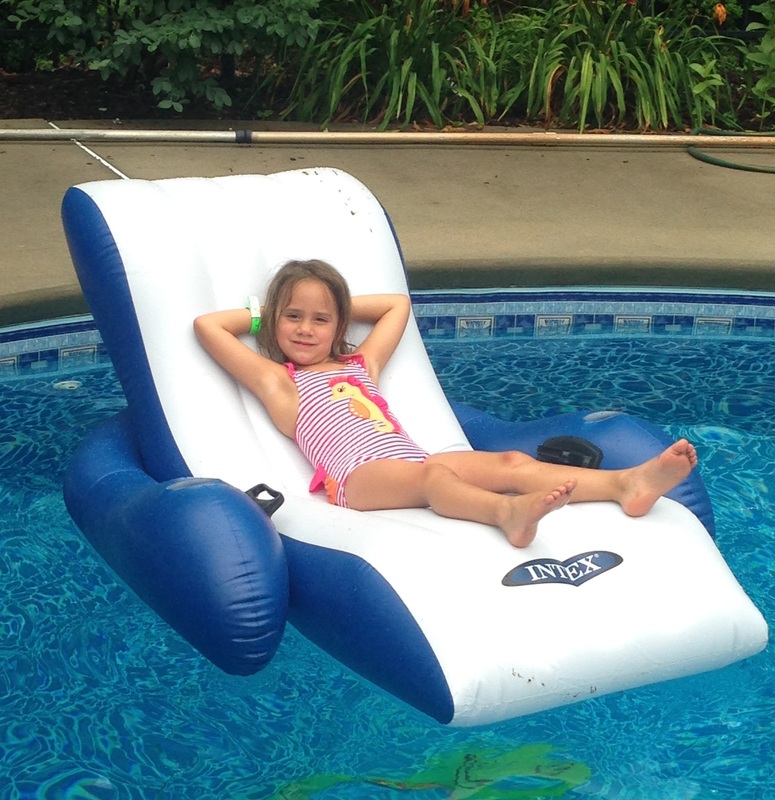 In our pool chaise lounge contest, this pool float came in first. Here is what our float experts liked about it. Inflate the different sections to your comfort level. Slightly deflate the head rest and back rest for a more reclined position. If you like to sit up right, like I do this is a great float. It keeps me dry on days that I don't want to get wet and would like to read a book. Or you can fold the foot rest under and it becomes a floating chair. On a hot day your feet can be dangling in the cool water. 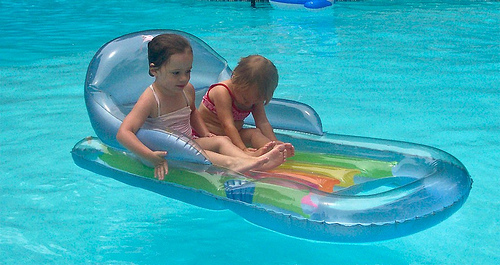 Once you relax on a fabric pool float, you will never want to go back to sticky plastic. This one has a blue nylon cover that just feels comfortable and doesn't get hot. A nice deep drink holder keeps drinks from falling out and helps to keep them cold as well. For real relaxation you need a place to put your arms. These big arm rests make this pool float stand out from the others. While I am only 5' tall, this float can accommodate adults of all sizes. There is lots of width and length. 38" x 55 "x 17"
There are 5 compartments or bladders to inflate. There are zippers that close the fabric over the bladders. They can be adjusted to your personal preference - more air the more upright. I like a float that sits up right because I like to read while relaxing in the pool. Let some air out. Under inflate the the pillow and the backrest and you can then lean your head back. The float is made by SwimLine and it costs around $50. Ours is holding up great, no leaking or fabric tearing. What makes this inflatable float unique is the contoured shape. Sitting up right you can enjoy conversations with others or enjoy a quiet moment in the pool by yourself reading a book. There are two air chambers to fill and a built in cup holder. Measuring 74" by 39". Very thick durable plastic means it will not easily develop a leak or lose air. If you enjoy staying dry and above the water this float is for you. Why didn't we get a portable air pump sooner? Last summer it took my husband well over an hour to inflate a large toy octopus with an old air compressor. He was not happy with me, until he saw how much fun the kids had playing on it. Now we have two new portable ones - a hand pump that inflates as you push down and pull up and a battery operated one that's even quicker and better for larger pool floats and toys. Save your lungs and keep everyone happy with a pump that inflates quickly and deflates your pool floats for easy storage. 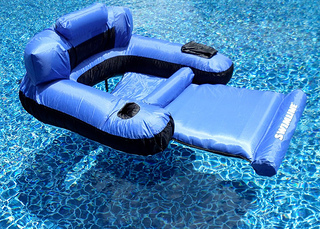 Whether you want to spend a little or a lot, an inflatable pool lounge is a must for any pool owner.